…far below average, even below what you’d get from a food court. The broccoli was not overcooked though, and noticeably fresh — a sharp contrast to everything else in the dish. …it didn’t inspire me to want to return, but given the abomination of a meal I just had, that was already a given anyways. …there are so many great restaurants in this area that eating here just doesn’t make any sense at all. 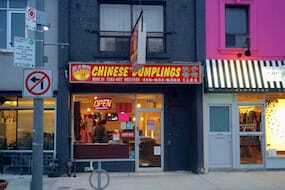 And if Chinese food is what you’re craving, Chinatown is only a short TTC ride away. Lesson learned! I had walked by a couple times and saw that they were renovating the restaurant before their grand opening, but the renovations weren’t extensive so they weren’t closed for very long. 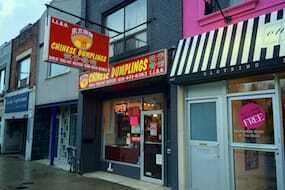 Apart from a new food prep station where they can make dumplings from scratch in the front window, (like they do in Chinatown, which was a good sign), the most noticeable change was the generous addition of much needed light. It’s much brighter and cleaner now than it was before. When you name your restaurant Chinese Dumplings, obviously dumplings are going to be your forte, so I went ahead and ordered #15 — Dumpling Combo (3 choices, $7.95). My three choices were #1 Pork & Chinese Cabbage, #2 Pork & Chive Dumpling and #11 Pork & Chive, Shrimp Dumpling. Each order of dumplings comes with 15 pieces, so in this case, five of each. The dumplings were good. Really good, actually. Noticeably fresh, very well made, flavourful, addictive; it was very hard to find anything wrong with them. Just what you’d expect from an authentic restaurant in Chinatown, or actually way better if you’re comparing to Mother’s Dumplings on Spadina. I was excited to have this so close to home! My wife Michelle was on her way home from work, so I decided to have some more tea and wait for her so she could join me and try them herself. Yes, they were that good that I wanted her to try them right away! In the meantime, I got a little impatient so I decided to order #35 — Garlic Deep Fried Chicken Wings (4 pieces, $5.99) to nibble on while I waited. When the chicken wings came out, I was quite shocked to see them. Overcooked, deformed… They looked like someone had sliced through them individually and the meat was coming off the bone as a result. How could these chicken wings have come out of the same kitchen that just produced some of the best dumplings I’ve ever had? They tasted better than they looked but were easily the worst chicken wings I’ve ever gotten from a Chinese restaurant. Totally not worth the $1.50 per wing they’re charging! I started wondering if perhaps their dumplings are the only thing worth ordering? The service was very attentive from start to finish and it was obvious that they’re trying very hard to please their customers. They’re off to a good start! I noticed out of the corner of my eye that the staff were sharing some baked potato that just came out of the oven, so I asked is that sweet potato? Our waitress not only confirmed it, but then went over to grab some for us and insisted we have some too. By then, we were stuffed and there was no way we could eat anything more, but it was nonetheless an unexpected super nice gesture that left a great impression on us. They’re genuinely nice people not just trying to make a quick buck! I remembered how dark and smelly the bathroom was before when it used to be Spicy & Sweet, so I thought I’d go downstairs to see if they had done any renovations to fix it up. Unfortunately, not only was it not renovated at all, but it looked like it hadn’t been cleaned in the eight months since my last visit either. Ugh. I remained curious about the rest of the food at Chinese Dumplings. Could it be that their dumplings are really the only thing worth ordering? How’s their take-out? I wanted to find out, so two weeks later I ordered some food by phone and Michelle picked it up on her way home from a work function. #133 — House Fried Noodles ($8.99) was very watery, soggy, overcooked and overall far worse than I was expecting, but #103 — Sautéed Assorted Seafood with Cashew & Snow Peas ($14.95) was very much above average for Chinese take-out. Fresh, not overcooked, crunchy, tasty and flavourful, but nothing remarkable that I’m dying to order again anytime soon either. Being as stubborn and curious as I am, I’ll likely end up trying something else at Chinese Dumplings at some point in the distant future. But for now, it’s their dumplings that will have me coming back. For everything else, I’ll hop on the streetcar and head to Chinatown. 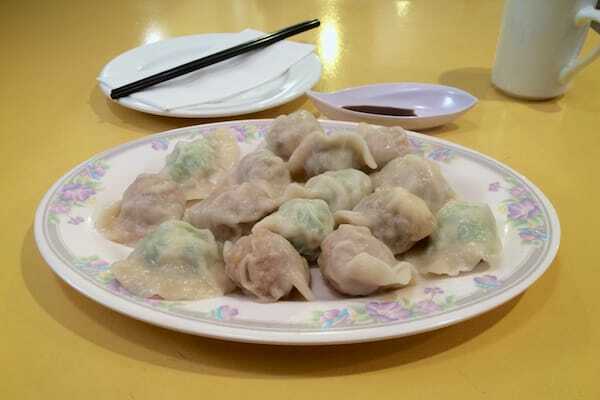 Chinese Dumplings was published by Daniel Menjívar on January 8, 2015 at 10:03:42 AM EST and last updated on April 18, 2019 at 4:40:56 PM UTC .